IEX Cloud is a platform that makes financial data and services accessible to everyone. The IEX Cloud API is based on REST, has resource-oriented URLs, returns JSON-encoded responses, and returns standard HTTP response codes. IEX Cloud authenticates your API requests using your account’s API tokens. To use any IEX Cloud API, you must pass an API token with each request. If you do not include your API token when making an API request, or use one that is incorrect or disabled, IEX Cloud returns an error. IEX Cloud provides two types of API tokens: publishable and secret. Secret API tokens should be kept confidential and only stored on your own servers. Your account’s secret API token can perform any API request to IEX Cloud. Keep your secret token safe. Your secret token can make any API call on behalf of your account, including changes that may impact billing such as enabling pay-as-you-go charges. Do not store your secret token in your version control system. Do not use your secret token outside your web server, such as a browser, mobile app, or distributed file. Monitor usage of your API for anomalies. If you observe unauthorized or abnormal usage, rotate your API token. IEX Cloud provides multiple options to address abnormal usage. ..* You may use the IEX Cloud console to rotate an API token. Rotating a token will disable access to IEX Cloud for the rotated token within 10 seconds. ..* You may use the IEX Cloud API or console to disable pay-as-you-go. This may prevent unexpected charges due to unauthorized or abnormal usage. Do not embed API keys directly in code. Instead of directly embedding API keys in your application’s code, put them in environment variables or in include files that are stored separately from the bulk of your code—outside the source repository of your application. Then, if you share your code, the API keys will not be included in the shared files. Do not store API tokens in inside your application’s source control. If you store API tokens in files, keep the files outside your application’s source control system. This is particularly important if you use a public source code management system such as GitHub. Limit access with restricted tokens. IEX Cloud console will allow you to specify the IP addresses or referrer URLs associated with each token, reducing the impact of a compromised API token. Use independent API tokens for different apps. This limits the scope of each token. If an API token is compromised, you can rotate the impacted token without impacting other API tokens. Certain products, such as the Core Financial API, measure usage in message counts. We calculate message counts by multiplying the type of data object by that data object’s weight. Data objects are commonly understood units, such as a single stock quote, company fundamentals, or news headline. Weights are determined by taking two factors into consideration: frequency of distribution and acquisition costs. Weighting can be found in the Data Weighting section of each API endpoint. Type of data: Different API calls have different weightings, all of which is included in our documentation. Frequency: If you’re requesting a data point every minute versus every hour, you’ll use 60x the messages. No surprise there. API calls will return iexcloud-messages-used in the header to indicate the total number of messages consumed for the call. IEX Cloud will release new versions when we make backwards-incompatible changes to the API. We plan to support up to three active versions and will give advanced notice before releasing a new version or retiring an old version. Every account will be assigned two test tokens available via the Console. All the same endpoints as production will be available in the Sandbox Environment. Please note API data will be manipulated to scramble values and is not suitable for production usage. We’ve also updated the Usage Report to allow you to view the number of test messages the same way as production message usage. Your test token is available on the console by click the “View Test Data” toggle in the nav. All tier features are enforced at this time, but you are not limited by the number of calls you can make. You are not charged for test usage. Test tokens look like Tpk_ and Tsk_. To make a call for test data, use the same url, but pass your test token. IEX Cloud only applies request limits per IP address to ensure system stability. We limit requests to 100 per second per IP measured in milliseconds, so no more than 1 request per 10 milliseconds. We do allow bursts, but this should be sufficient for almost all use cases. Case does not matter when passing values to a parameter unless specified in the docs. Be sure to url-encode the values you pass. Most endpoints support a filter parameter to return a subset of data. Pass a comma-delimited list of response attributes to filter. Response attributes are case-sensitive and are found in the Response Attributes section of each endpoint. Example: ?filter=symbol,volume,lastSalePrice will return only the three attributes specified. We support Server-sent Events (SSE Streaming) for streaming data as an alternative to WebSockets. You will need to decide whether SSE streaming is more efficient for your workflow than REST calls. In many cases streaming is more efficient since you will only receive the latest available data. If you need to control how often you receive updates, then you may use REST to set a timed interval. When you connect to an SSE endpoint, you should receive a snapshot of the latest message, then updates as they are available. We use a reserve system for streaming endpoints due to high data rates. This is similar to how a credit card puts a hold on an account and reconciles the amount at a later time. When you connect to an SSE endpoint, we will validate your API token, then attempt to reserve an amount of messages from your account. For example, 1000 messages. If you have enough messages in your quota, or you have pay-as-you-go enabled, we will allow data to start streaming. We keep track of the number of messages streamed to your account during our reserve interval. Once our reserve interval expires, we will reconcile usage. This means we will compare how many messages were sent versus the number of messages we reserved. For example, if we delivered 1200 messages, you would have used 200 more than we reserved, so we will apply 200 additional messages to your account. If we only delivered 100 messages, we would credit the 900 unused messages back to your account. After we reconcile the messages, we will attempt another reserve. 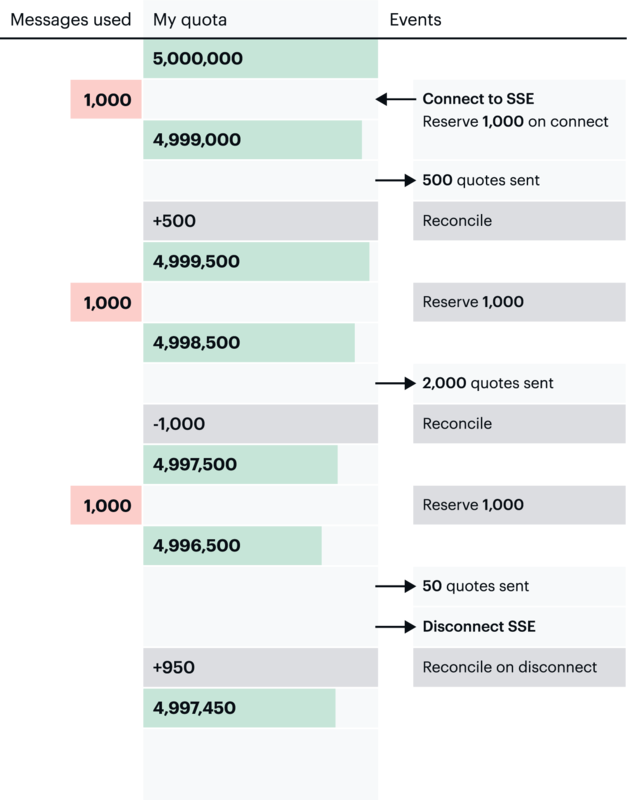 The reserve and reconcile process is seamless and does not impact your data stream. If we attempt to reserve messages and your account does not have enough quota and pay-as-you-go disabled, then we will disconnect your connection. You can avoid service disruptions by enabling pay-as-you-go in the Console. When you disconnect from an endpoint, we will reconcile your message usage immediately. Scale users can firehose stream all symbols (excluding DEEP endpoints) by leaving off the symbols parameter. Some SSE endpoints are offered on set intervals such as 1 second, 5 seconds, or 1 minute. This means we will send out messages no more than the interval subscribed to. This helps make message delivery more predictable. Attribution is required for all users. It is as simple as putting “Data provided by IEX Cloud” somewhere on your site or app and linking that text to https://iexcloud.io. In case of limited screen space, or design constraints, the attribution link can be included in your terms of service. If you find any issues with our API or have any questions, please file an issue at Github. If your account includes support, you’ll find additional support options when logged into your Console. Reach out to the developer and ask about supporting IEX Cloud. Making your first REST API call is easy and can be done from your browser. Your publishable token which is found in the console. The URL for the type of data you would like to request. IEX Cloud supports Excel and Google Sheets data import methods. Excel provides the Webservice function to import data into a cell. We support this in endpoints like quote, stats, financials, cash-flow, balance-sheet, income, and dividends. IEX Cloud provides an example Excel file that can be used to see how the Webservice function works. Download it here - the Excel webservice function only works on Excel for Windows. Google Sheets provides IMPORT functions to populate cells with data. You can also return most endpoints as CSV by passing a query parameter of format=csv. Used to retrieve account details such as current tier, payment status, message quote usage, etc. Requires SK token to access. Used to retrieve current month usage for your account. Used to toggle Pay-as-you-go on your account. Note when you turn off pay-as-you-go, there is a 30 second period before you can re-enable. token Required (Boolean) Your SK API token. allow Required (Boolean) Pass true to enable Pay-as-you-go, or false to disable. Making your first Signed REST API requires a little more effort. This approach has been heavily based on Amazon’s V4 signing approach. The basic idea is to take your secret key, and use that to generate a cryptographic fingerprint of all aspects of your request, so they can be verified by the server, so the interception of the data over the network does not compromise your account. However, you must take care that your secret key for your publishable key is not compromised! Signs a token, so it will require signed headers when a request is made using this token. Note that the unsign attribute is optional and will allow you to unsign a key. You may run this API call more than once, and it will generate a new secret for the token each time. Returns the secret for a token, thus making it “signed”. Copyright 2019-2020 iexcloud. or its affiliates. All Rights Reserved. # Copyright 2019-2020 iexcloud. or its affiliates. All Rights Reserved. IEX Cloud data can be organized into three generic data APIs: time-series, data-tables, and data-points. Each API type is self describing and the docs can be accessed without an API token. Data points are available per symbol and return individual plain text values. Retrieving individual data points is useful for Excel and Google Sheet users, and applications where a single, lightweight value is needed. We also provide update times for some endpoints which allow you to call an endpoint only once it has new data. To use this endpoint, you’ll first make a free call to list all available data points for your desired symbol, which can be a security or data category. Once you find the data point you want, use the key to fetch the individual data point. Get a data point: The weight specified in the data list. weight number Data weight to call the individual data point in number of messages. lastUpdated string ISO 8601 formatted date time the data point was last updated. In Development The data tables endpoint provides structured data that is not date or time dependent. Data can contain a variety of rows, columns, and data types and is structured as a JSON array of objects. In development Time series is a collection of data points indexed over a period of time. Time series is accessed by a specific data key and indexed by a date field. You are able to retrieve any range of data through available datetime parameters. Returns everything in key stats plus additional advanced stats such as EBITDA, ratios, key financial data, and more. beta number Beta is a measure used in fundamental analysis to determine the volatility of an asset or portfolio in relation to the overall market. Levered beta calculated with 1 year historical data and compared to SPY. • number. Specify the number of quarters or years to return. One quarter is returned by default. You can specify up to 12 quarters with quarter, or up to 4 years with annual. currentCash number Represents current cash excluding short-term investments. Current cash excludes commercial paper issued by unconsolidated subsidiaries to the parent company, amount due from sale of debentures, checks written by the company but not yet deposited and charged to the company’s bank account, and promissory notes. shortTermInvestments number Total short-term investments. inventory number Represents tangible items or merchandise net of advances and obsolescence acquired for either resale directly or included in the production of finished goods manufactured for sale in the normal course of operation. Excludes tools that are listed in current assets, supplies and prepaid expenses for companies that lump these items together, advances from customers, and contract billings. For non-U.S. companies, if negative inventories arise from advances from customers greater than costs on long-term contracts, it is reclassified to current liabilities. otherAssets number Returns other assets for the period calculated as other assets including intangibles minus intangible other assets. totalAssets number Represents the sum of total current assets, long-term receivables, investment in unconsolidated subsidiaries, other investments, net property plant and equipment, deferred tax assets, and other assets. otherCurrentLiabilities number Represents other current liabilities and calculated as the sum of misc current liabilities, dividends payable, and accrued payroll. totalCurrentLiabilities number Represents debt or other obligations that the company expects to satisfy within one year. otherLiabilities number Returns other liabilities for the period calculated as the sum of other liabilities excluding deferred revenue, deferred income, and deferred tax liability in untaxed reserves. minorityInterest number Represents the portion of earnings/losses of a subsidiary pertaining to common stock not owned by the controlling company or other members of the consolidated group. Minority Interest is subtracted from consolidated net income to arrive at the company’s net income. totalLiabilities number Represents all short and long term obligations expected to be satisfied by the company. Excludes minority interest preferred stock equity, preferred stock equity, common stock equity, and non-equity reserves. capitalSurplus number Represents the amount received in excess of par value from the sale of common stock. Along with common stock it is the equity capital received from parties outside the company. shareholderEquity number Total shareholders’ equity for the period calculated as the sum of total common equity and preferred stock carrying value. Pulls cash flow data. Available quarterly or annually, with the default being the last available quarter. netIncome number Represents income before extraordinary items and preferred and common dividends, but after operating and non-operating income and expenses, minority interest and equity in earnings. depreciation number Depreciation represents the process of allocating the cost of a depreciable asset to the accounting periods covered during its expected useful life to a business. Depletion refers to cost allocation for natural resources such as oil and mineral deposits. Amortization relates to cost allocation for intangible assets such as patents and leasehold improvements, trademarks, book plates, tools & film costs. This item includes dry-hole expense, abandonments and oil and gas property valuation provision for extractive companies. This item excludes amortization of discounts or premiums on financial instruments owned or outstanding and depreciation on discontinued operations. changesInInventories number Represents the change in the amount of inventories from one year to the next as reported in the cash flow statement. cashChange number Represents the change in cash and short term investments from one year to the next. This item is available only when the Statement of Changes in Financial Position is based on cash and short term investments. cashFlow number Returns net cash from operating activities for the period calculated as the sum of funds from operations, extraordinary items, and funds from other operating activities. capitalExpenditures number Returns total capital expenditures for the period calculated as the sum of capital expenditures additions to fixed assets, and additions to other assets. investingActivityOther number Represents any other funds employed in investing activities and not included in capital expenditures, net assets from acquisitions, increase in investments, decrease in investments or additions to property. dividendsPaid number Represents the total common and preferred dividends paid to shareholders of the company. Excludes dividends paid to minority shareholders. otherFinancingCashFlows number Returns other financing activities for the period. cashFlowFinancing number Returns net cash from financing activities for the period. exchangeRateEffect number Represents the effect of translating from one currency to another on the cash flow of the company. Name of the sector, tag, or list to return and is case sensitive. Earnings data for a given company including the actual EPS, consensus, and fiscal period. Earnings are available quarterly (last 4 quarters). If you are looking for upcoming earnings, use the Estimates endpoint. last Optional (Number) - Number of quarters or years to return. Default is 1.
field Optional (String) - case sensitive string matching a response attribute below. Returns raw value of field specified. Useful for Excel Webservice calls. actualEPS number Actual earnings per share for the period. EPS data is split-adjusted by default. Earnings data accounts for all corporate actions including dilutions, splits, reverse splits, spin-offs, exceptional dividends, and rights issues. yearAgoChangePercent number Represents the percent difference between the quarter a year ago actualEPS and current period actualEPS. This endpoint is carried over from the IEX 1.0 API. Use our new cash flow, income statement, and balance sheet endpoints for new data. Returns the top 10 fund holders, meaning any firm not defined as buy-side or sell-side such as mutual funds, pension funds, endowments, investment firms, and other large entities that manage funds on behalf of others. reportDate number refers to the update time of report_date in milliseconds since midnight Jan 1, 1970.
reportedMv number Market value held by the fund as reported in the source, represented in USD. Returns adjusted and unadjusted historical data for up to 15 years. Useful for building charts. This endpoint is carried over from the IEX 1.0 API, and has become too complicated. We are working on new endpoints to simplify time series queries. If you’re looking for intraday prices, use the intraday endpoint. Example: If you query for AAPL 5 day, it will return 5 days of prices for AAPL for a total of 50.
date Specific date If used with the query parameter chartByDay, then this returns historical OHLCV data for that date. Otherwise, IEX-only data by minute for a specified date if available. Date format YYYYMMDD. Currently supporting trailing 30 calendar days of minute bar data. You can use the Previous endpoint if you only need the previous day. • boolean. Will return adjusted data only with keys date, close, and volume. • boolean. Used only when range is date to return OHLCV data instead of minute bar data. • string. Same format as the path parameter. This can be used for batch calls. • string. Formatted as YYYYMMDD. This can be used for batch calls when range is 1d or date. high number Adjusted data for historical dates. Split adjusted only. low number Adjusted data for historical dates. Split adjusted only. volume number Adjusted data for historical dates. Split adjusted only. open number Adjusted data for historical dates. Split adjusted only. close number Adjusted data for historical dates. Split adjusted only. uHigh number Unadjusted data for historical dates. uLow number Unadjusted data for historical dates. uVolume number Unadjusted data for historical dates. uOpen number Unadjusted data for historical dates. uClose number Unadjusted data for historical dates. changeOverTime number Percent change of each interval relative to first value. Useful for comparing multiple stocks. label number A human readable format of the date depending on the range. change number Change from previous trading day. changePercent number Change percent from previous trading day. Pulls income statement data. Available quarterly or annually with the default being the last available quarter. totalRevenue number Calculated as the sum of gross income (the difference between sales or revenues and cost of goods sold and depreciation) and cost of goods sold for the period. sellingGeneralAndAdmin number Represents expenses not directly attributable to the production process but relating to selling, general and administrative functions. Excludes research and development. operatingIncome number Represents operating income for the period calculated as (net sales or revenue) - (cost of goods sold) - (selling, general & administrative expenses) - (other operating expenses). This will only return for industrial companies. otherIncomeExpenseNet number Calculated as income before tax minus operating income. pretaxIncome number Represents all income/loss before any federal, state or local taxes. Extraordinary items reported net of taxes are excluded. incomeTax number Represents all income taxes levied on the income of a company by federal, state and foreign governments. Excludes domestic international sales corporation taxes, ad valorem taxes, excise taxes, windfall profit taxes, taxes other than income, and general and services taxes. minorityInterest number Represents the portion of earnings/losses of a subsidiary pertaining to common stock not owned by the controlling company or other members of the consolidated group. Returns the top 10 insiders, with the most recent information. Returns aggregated insiders summary data for the last 6 months. fullName string Full name of the individual. This field concatenates the individuals First Name, Middle Name, Last Name and Suffix. effectiveDate number Effective date of the transaction. tranPrice number As-reported (unadjusted) unit price at which shares were acquired or disposed, represented in USD. tranShares number As-reported (unadjusted) number of shares acquired or disposedValue of the transaction, calculated as Tran_Shares * Tran_Price, represented in USD. This value is not adjusted for corporate actions. tranValue number Value of the transaction, calculated as Tran_Shares * Tran_Price, represented in USD. This value is not adjusted for corporate actions. Returns the top 10 institutional holders, defined as buy-side or sell-side firms. This returns 1 minute bar data where open, high, low, and close are per minute. If you need the latest stock price use the quote endpoint. Example: If you query for AAPL 1d at 11:00am, it will return 90 minutes of data for a total of 50. • boolean. Limits the return of intraday prices to IEX only data. • boolean. If true, chart will reset at midnight instead of the default behavior of 9:30am ET. marketAverage number 15 minute delayed data. Average price during the minute across all markets. This represents data from all markets. If the value is null, then the market did not trade during the minute. marketNotional number 15 minute delayed data. Total notional value during the minute for trades across all markets. This represents data from all markets. If the value is null, then the market did not trade during the minute. marketNumberOfTrades number 15 minute delayed data. Number of trades during the minute across all markets. This represents data from all markets. If the value is null, then the market did not trade during the minute. marketOpen number 15 minute delayed data. First price during the minute across all markets. This represents data from all markets. If the value is null, then the market did not trade during the minute. marketClose number 15 minute delayed data. Last price during the minute across all markets. This represents data from all markets. If the value is null, then the market did not trade during the minute. marketHigh number 15 minute delayed data. Highest price during the minute across all markets. This represents data from all markets. If the value is null, then the market did not trade during the minute. marketLow number 15 minute delayed data. Lowest price during the minute across all markets. This represents data from all markets. If the value is null, then the market did not trade during the minute. marketVolume number 15 minute delayed data. Total volume of trades during the minute across all markets. This represents data from all markets. If the value is null, then the market did not trade during the minute. marketChangeOverTime number Percent change of each interval relative to first value. 15 minute delayed consolidated data. simplifyFactor array Only when chartSimplify is true. The first element is the original number of points. Second element is how many remain after simplification. average number IEX only data. Average price during the minute for trades on IEX. notional number IEX only data. Total notional value during the minute for trades on IEX. numberOfTrades number IEX only data. Number of trades during the minute on IEX. high number IEX only data. Highest price during the minute on IEX. low number IEX only data. Lowest price during the minute on IEX. volume number IEX only data. Total volume during the minute on IEX. open number IEX only data. First price during the minute on IEX. close number IEX only data. Last price during the minute on IEX. If you want to load a single stat into Excel, use the second example above. It shows how to pull the next earnings date. marketcap number Market cap of the security calculated as shares outstanding * previous day close. float number Returns the annual shares outstanding minus closely held shares. url string URL to IEX Cloud for associated news image. Note: You will need to append your token before calling. image string URL to IEX Cloud for associated news image. Note: You will need to append your token before calling. Returns the official open and close for a give symbol. The official open is available as soon as 9:45am ET and the official close as soon as 4:15pm ET. Some stocks can report late open or close prices. price number refers to the official open price. Will return 0 if symbol has no volume for the day. price number refers to the official close price. Will return 0 if symbol has no volume for the day. An array of peer symbols. This returns previous day adjusted price data for one or more stocks. Returns a number. Refer to the latestPrice attribute in the quote endpoint for a description. • Case sensitive string matching a response attribute below. Specifying an attribute will return just the attribute value. This is useful for Excel Webservice calls. Here is an example of how to pull the latest price of the stock as a number. This is a great way to get values into Excel. IEX real time price represents trades on IEX only. Trades occur across over a dozen exchanges, so the last IEX price can be used to indicate the overall market price. This will not included pre or post market prices. latestVolume number Use this to get the latest volume Refers to the latest total market volume of the stock across all markets. This will be the most recent volume of the stock during trading hours, or it will be the total volume of the last available trading day. latestUpdate number refers to the machine readable epoch timestamp of when latestPrice was last updated. Represented in milliseconds since midnight Jan 1, 1970.
latestTime string refers to a human readable time of when latestPrice was last updated. The format will vary based on latestSource is inteded to be displayed to a user. Use latestUpdated for machine readable timestamp. latestSource string This will represent a human readable description of the source of latestPrice. Possible values are "IEX real time price", "15 minute delayed price", "Close" or "Previous close"
changePercent number Refers to the percent change in price between latestPrice and previousClose. For example, a 5% change would be represented as 0.05. You can use the query string parameter displayPercent to return this field multiplied by 100. So, 5% change would be represented as 5.
high number refers to the market-wide highest price from the SIP. 15 minute delayed during normal market hours 9:30 - 16:00 (null before 9:45 and weekends). low number refers to the market-wide lowest price from the SIP. 15 minute delayed during normal market hours 9:30 - 16:00 (null before 9:45 and weekends). extendedPrice number refers to the 15 minute delayed price outside normal market hours 0500 - 0930 ET and 1600 - 2000 ET. This provides pre market and post market price. This is purposefully separate from latestPrice so users can display the two prices separately. extendedChange number refers to the price change between extendedPrice and latestPrice. extendedChangePercent number refers to the price change percent between extendedPrice and latestPrice. delayedPrice number refers to the 15 minute delayed market price from the SIP during normal market hours 9:30 - 16:00 ET. delayedPriceTime number refers to the last update time of the delayed market price during normal market hours 9:30 - 16:00 ET. marketCap number is calculated in real time using latestPrice. avgTotalVolume number refers to the 30 day average volume. iexRealtimePrice number refers to the price of the last trade on IEX. iexRealtimeSize number refers to the size of the last trade on IEX. iexLastUpdated number refers to the last update time of iexRealtimePrice in milliseconds since midnight Jan 1, 1970 UTC or -1 or 0. If the value is -1 or 0, IEX has not quoted the symbol in the trading day. Pulls data from the last four months. description string Description of the split event. This will return all upcoming estimates, dividends, splits for a given symbol or the market. If market is passed for the symbol, ipos will also be included. Use with caution. Due to the number of events returned, this can use a large number of messages. Please check the data weight of each type before using. This can return over 4,000 estimates for 40m messages. By default, earnings will only return symbol and reportDate for a weight of 5 for each item. If you use fullUpcomingEarnings parameter, the full estimates object is returned for the full weight. Only available to Launch, Grow, and Scale users. fullUpcomingEarnings Boolean. If set to true and passed to upcoming-events or upcoming-earnings, it will return the full estimate object at the full estimate weight. This can cause the call to be in the millions of messages. Response is an object with each item being an array of objects matching the type of data returned. This will a quote for Cryptocurrencies supported by the IEX API. Each element is a standard quote. We are currently working on a new feed that will provide real time quotes and trades for about 15 cryptocurrencies. Launch, Grow, and Scale tiers only. type Optional. Can only be daily or minute. Default is daily. date Optional. Format YYYYMMDD date to fetch sentiment data. sentiment number Number between -1 and 1 where -1 is most bearish and 1 is most bullish. totalScores number Number of social data inputs to generate the sentiment value. positive string Percent of social messages with positive sentiment. negative string Percent of social messages with negative sentiment. minute string Only provided when minute is requested. Minute represented as HHmm. This endpoint provides CEO compensation for a company by symbol. This call returns an array of symbols that IEX Cloud supports for API calls. We are currently working on support for OpenFIGI. This call returns an array of symbols the Investors Exchange supports for trading. This list is updated daily as of 7:45 a.m. ET. Symbols may be added or removed by the Investors Exchange after the list was produced. This call returns an array of international symbols that IEX Cloud supports for API calls. isEnabled will be true if the symbol is trading. Returns an array of U.S. exchanges. description string Full name of the exchange. name string Full name of the exchange. mic string Market identifier code for the exchange. tapeId string ID used to identify the exchange on the Consolidated Tape. oatsId string FINRA OATS exchange participant ID. This call allows you to fetch a number of trade dates or holidays from a given date. For example, if you want the next trading day, you would call /ref-data/us/dates/trade/next/1. Back to 2017 to forward 2 years. direction string • Optional. Can be next or last. Default is next. next will return today if today is a holiday. startDate string • Optional. Used to specify the start date for next or last. Format is YYYYMMDD. Defaults to today. date string Trading or holiday date depending on the type specified. Formatted as YYYY-MM-DD. settlementDate string T+2 trade settlement date depending on the type specified. Formatted as YYYY-MM-DD. This call returns an array of mutual fund symbols that IEX Cloud supports for API calls. This call returns an array of OTC symbols that IEX Cloud supports for API calls. This call returns a list of supported currencies and currency pairs. currencies array Array of currencies. Each currency is an object containing a code and name as strings. pairs array Array of supported currency pairs. Each pair is an object containing from code and to code. This endpoint provides an end of day exchange rate of a given currency pair. For an example of an app that’s using TOPS, see the TOPS viewer app. price refers to last sale price of the stock on IEX. The Security event message is used to indicate events that apply to a security. A Security event message will be sent whenever such event occurs. The paused and released into an Order Acceptance Period status will be disseminated for IEX-listed securities only. Trading pauses on non-IEX-listed securities will be treated simply as a halt. Used to retrieve current system status. Version 1 is available and new version types are available. Added ability to fetch historical data for a single date. Historical prices with range date can use query parameter chartByDay to return a single day close information. Added international equities. Now supporting EOD Canadian prices. Lowered weight of /stock/OHLC endpoint from 2 to 1, and max weight of 500. Teams You can now invite team members to your account. Introduced a dedicated domain for the sandbox environment. /status endpoint updated with version number to track when changes are made. Updated /stock/batch endpoint to return data for any valid symbol rather than error out the whole call for one bad symbol.